Introducing the RTV-X1120, Kubota’s Best-Valued Utility Vehicle. Kubota Tractor Corporation, the best-selling diesel utility vehicle manufacturer in North America since 2004*, has enhanced their current market standards with the introduction of the new RTV-X1120 models, Kubota's most well-equipped utility vehicle at the best price among its competition. Designed for the commercial customers who use these machines for heavy duty work every day, the Kubota RTV-X1120 combines Kubota quality with enhanced power, torque and performance at a starting price point of $13,999 MSRP. The RTV-X1120 features a 24.8 gross horsepower diesel engine, dependable and ready for any job. Kubota-built and all-terrain proven, the 3-cylinder liquid-cooled diesel engine has a well-earned reputation for providing extra acceleration and climbing power. The engine and VHT-X transmission provide a top speed of 29 mph as well as plenty of hill-climbing power. With the increased speed comes an increased dynamic load, so the RTV-X1120 comes equipped with three-point seatbelts for safety. 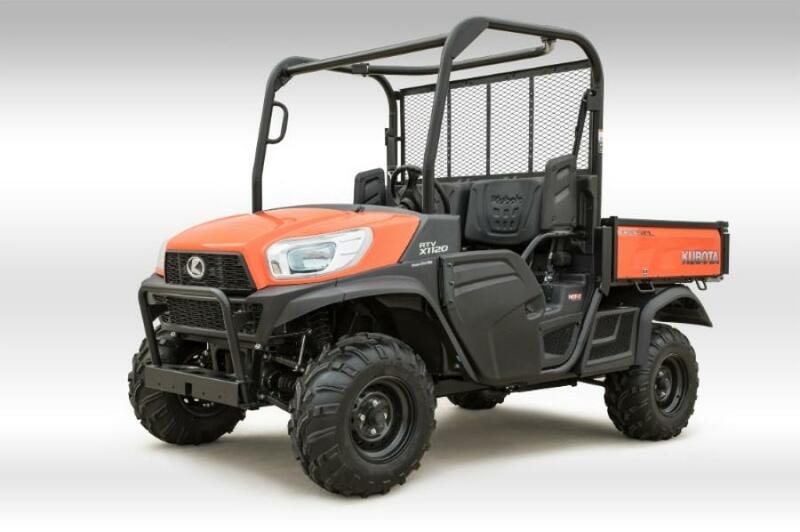 Kubota's X Series was designed for comfort and convenience under tough working conditions and the RTV-X1120 includes style and creature comforts found in the RTV-X family. Designed for reducing operator fatigue during long work days, the RTV-X1120 features new shoulder restraints for the operator and passenger, ergonomically designed 60:40 split bucket seats, digital dashboard display, fully hydraulic power steering, easily accessible parking brake and large under seat storage compartments. The RTV-X1120 models are available in two color options: Kubota Orange and RealTree AP Camo. Options include machine-polished alloy wheels (standard on RTV-X1120D models only), optional black alloy rims and a spray-on bed liner is also available on all models except for the General Purpose model. The heavy-duty cargo steel cargo box on the RTV-X1120 models provides ample room to haul gear, supplies, tools and material around a jobsite. Plus, with the simple switch of a lever, the hydraulic-lift (worksite models only) cargo box rises to dump materials, allowing more efficiency and less manual labor unloading cargo. Standard two-inch receivers are located at the front and back of the vehicle, allowing a tow capacity up to 1,300 lbs. The new RTV-X1120 models offering will be available at Kubota dealerships in February 2018. For more information visit KubotaUSA.com.